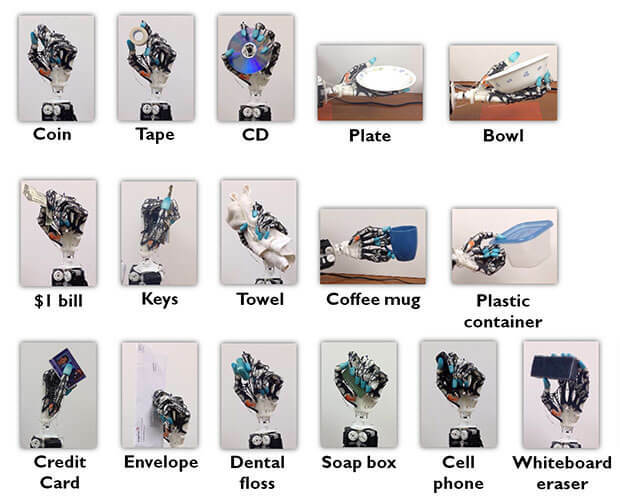 Most of today’s robot hands can perform easy tasks. They’re uber-practical grippers, simple and useful. But is it really so much to ask for robotic masterworks as dextrous as Luke Skywalker’s bionic hand in Star Wars? In short, yes, yes it is. It might have been a long time ago in a galaxy far far away—but most Star Wars tech is beyond us. Still, it’s hard not to get in a Star Wars state of mind watching this beautiful robot hand engineered by Yale postdoc Joseph (Zhe) Xu and the University of Washington’s Emanuel Todorov. The hand closely mimics the natural design and structure of a human hand. Artificial bones were 3D printed from a laser scan of a real skeleton hand; ligaments were fashioned from ultra-strong, lightweight strings; and laser-cut rubber sheets act as soft tissue for stability, flexibility, and torque. All this is controlled by an array of servos and cables. Xu says, to date, human-inspired robotic hands have “mechanized biological parts” instead of trying to closely replicate them. Simple approximation has merit, but it also does away with key biomechanical features, and so, the hands fall short of human-level dexterity. Remotely manipulated by a person wearing a sensor-laden glove, Xu and Todorov’s hand is capable of the same grips and hand positions we are. It can hold a variety of objects and useful everyday tools—plates, bowls, coins, dollar bills, dental floss. The hand can achieve all this without force feedback: The teleoperator can’t feel how tightly or softly they’re gripping an object. Xu and Todorov believe this is due to how closely the hand’s movements match the natural movements of a human hand. That said, the researchers aren’t resting on their laurels, and Xu recently posted another video showing a fingertip force sensor for the hand. 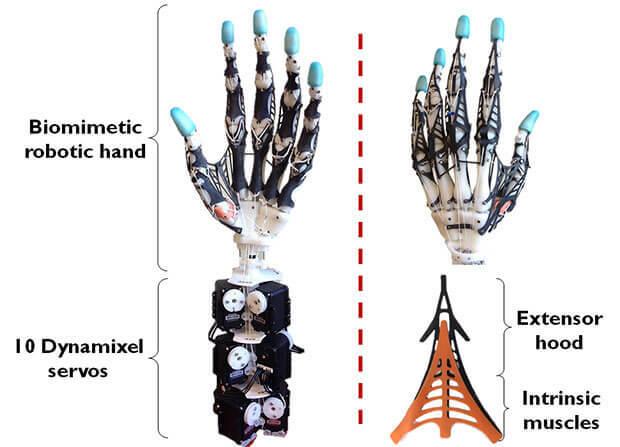 Though this particular hand is currently teleoperated by a human, it isn’t too much of a stretch to imagine a similarly designed, software-driven hand in a robotic system. Many current industrial robots don’t require this degree of manipulative precision, but the next generation of bots will. Some of the hardest tasks to automate in factories require human-level dexterity (e.g., handling circuit boards to tightly packing boxes). There’s no rule robot hands need to be just like ours to achieve the same dexterity. But it’s a good place to start. And our homes, offices, and cities were made with us in mind. For robots to confidently navigate our world—from emergency response to personal robots—it makes more sense to design them to use our stuff than vice-versa. But probably the most awe-inspiring potential use for robotic body parts isn’t about robots alone—it’s about robots and humans together. In recent years, robotic prosthetic devices have been making strides, from nerve-controlled prosthetic hands for amputees to brain-controlled robotic arms for paralyzed patients. And this is where it gets all Luke Skywalker. Xu and Todorov are thinking about neurosprosthetics like those just mentioned, but they’re also interested in artificial limb regeneration. Moonshot? Hell, yes. Still, the pieces are falling into place. It’s also about better integrating prosthetics into the body. Xu says we’re making progress printing bone structures with biocompatible materials, making biodegradable ligaments, growing muscles in petri dishes, and learning to regenerate peripheral nerves. It’s a sci-fi kind of a dream. But we love those. Especially when they’re becoming a little more science and a little less fiction.